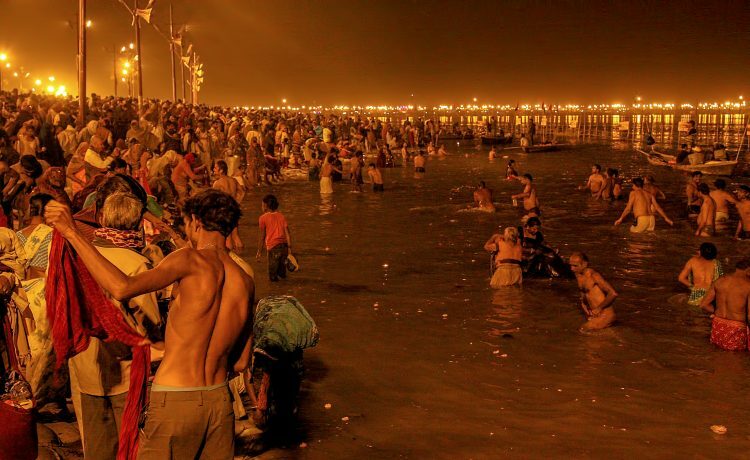 The KumbhMela of 2019 began on January 15 and is expected to end on March 4. More than 100 million devotees from all over the world come to this religious fair, making it the largest religious fair worldwide. UNESCO recognizes it as one kind festival and lists it under the Intangible Cultural Heritage of Humanity list. If this mela intrigues you, why not visit it this year? After all, it is held once every three years. Here’s a guide to let you know what to expect at the Kumbh 2019 India. KumbhMela at Prayagraj : This year, the Kumbh Mela is being held at Prayagraj, where the sangam or confluence of the Ganga, Yamuna and Saraswati can be seen. Objective of KumbhMela: This mela is a coming together of believers in Dharma. It is a unique occasion for devotees, saints, sages, deities and 33 core tirthas to come to the KumbhParva. The main objective of the KumbhMela is the unity of the Hindus. It is also a platform to showcase the cultural and religious immortality of the Hindus. It also showcases in-depth the features of Hindu Dharma to foreigners. The Kumbh Mela comprises rituals, the most significant among them being the bathing ritual. Millions of devotees present here to participate this religious ceremony by taking a dip in the holy Ganga at the TriveniSangam. The rich and diverse culture of Uttar Pradesh will be exhibited among five cultural pandals. These pandals will exhibit several cultural events like musical performances, folk dances etc, every day. The largest of them is the Ganga Pandal, where most of the major events will be on show. Renowned sages will hold spiritual events at the PravachanPandal and four convention centres, set up specifically for these events. At the start of the Kumbh Mela Varanasi, the event known as Peshwai is usually held. This spectacular event involves a procession of saints who are welcomed to the fair. They arrive in groups, seated on horses and elephants with bands. They follow the specially demarcated routes, led by saints belonging to various Akharas. People line the streets in welcome of these sages as they pass by, showering them with petals. The cheer and general enthusiasm of the crowd is something unbelievable and what words cannot communicate. So much happens during the day, but what about the night? Well, after sunset, the Mela grounds take on a different hue among other things, a laser sound and light show at the Prayagraj Fort Wall for public entertainment. Pilgrims and visitors can now witness the Kumbh Mela in 360 degree virtual reality, with arrangements for this set up at various points of the Mela grounds. Here, people can watch videos of the most important events at the Mela and feel if they are actually present at each of the events show there. A special VR headset will have to be used to get the full experience. The videos to be shown here include the Peshwai, the bathing days, Ganga aarti and other scenes from the Mela. Additionally, people from all over the world can use their mobile phones to witness the experience that is the KumbhMela. They can do this by installing the VR Devotee app and watch live and recorded videos. There are 25 eco-friendly entrance gates to the 2019 KumbhMela. They are attractively decorated and are spread with beautiful lighting, which definitely increases the aesthetic appeal of the fair. These designs are drawn from Indian culture and tradition. Situated on the river Yamuna, Prayagraj has access to waterways. So, this element has been innovatively used to ferry devotees and from the Mela. The Inland Waterways Authority of India has demarcated four ghats here that connect the KumbhMela to various parts of the state so that boats can ply to take devotees from the Mela and ghat to ghat. Apart from the religious aspect of using the waterways, these boats can also be used to explore the river routes of this area. Devotees will have to purchase tickets from designated counters or online. There are many boat options; one of them is the CL Kasturba, a semi-cruise liner on which you can also enjoy your dinner. Prayagraj presents a lot by way of historical and religious sites. Besides, it is steeped in history. To get to know the city really well, it’s best to walk around and find out all that you can. Therefore, tourist walks have been organized which take visitors to Prayagraj’s delightful attractions such as Bade Hanumanji Temple, Ram Ghat, Akshaya Vat, PatlapuriMandir, Allahabad Fort, etc. This is the creative hub of the Mela, apart from more than 13 pavilions that showcase unique and rare exhibits of Indian art and culture. Additionally, there are eight pavilions that show several types of art. Souvenir shops also dot these areas with unique and beautiful art collectibles to return home with. The authorities at the Allahabad Kumbh 2019 have made elaborate arrangements for food to be available to all devotees including the akhadas. The government is now running grocery stores to sell basic food items like rice, wheat, pulses, etc at lowered cost. Though tourists may prefer to cook their own food, yet no one should leave the Mela without trying out the free langars held at camps at several akhadas. Not only is it free, but also delicious and everyone will love experiencing dining in a community kitchen. The cuisines available at the Mela include Indian, Chinese, Continental among other internationally popular ones sold at reasonable rates. The Mela authorities have arranged for a wide spectrum of accommodation that caters to every pocket. The state government has set up a tent city called the Sangam Tent Colony, offering luxurious tents at Rs. 18,000 a night and Swiss Cottages at Rs. 9,000 per night. Private operators offer accommodation at the other end of the spectrum—dormitories beginning at Rs. 650 and going up to Rs. 35,000 per night for a 900 sq. feet luxury tent with all the modern conveniences you can imagine. In fact, this tent will comprise two bedrooms and a living room. Tents of varying sizes and prices are salso available at Indraprastham City, Vedic Tent City, Kumbh Canvas and KalpaVriksh. If you feel enthused to join in the Kumbh Mela festivities and enjoy the spiritual mela, make your bookings now. Even after you land at Prayagraj or Allahabad, it may be at the LalBahadurShastri International Airport in Varanasi, about 120 km from the ArdhaKumbhMela site. If you arrive by train, get off at Allahabad Junction. From here, take a bus, auto rickshaw or taxi to the mela site. If you drive down by bus, the Allahabad bus depot is on the map of major cities in north and central India. So, you will be able to reach here easily. This entry was posted in Festivals in India, Temples in India and tagged allahabad kumbh dates, kumbh dates, Kumbh Mela 2019. Bookmark the permalink.